This weekend I was introduced to a method of agriculture that has blown my mind! Its called aquaponics (aquaculture + hydroponics) and is probably the most beautiful combination of modern technology and natural harmony I have ever encountered. 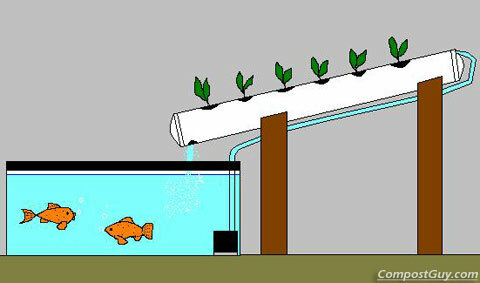 Starting from the bottom, you grow fish in a fish tank, usually gold fish, tilapia or other easy to grow freshwater fish. The waste that is produced by the fish is rich in amonia, nitrates and nitrites. This waste water is pumped from the bottom of a fish tank into another tank that is filled with clay balls. As the mineral rich water flows through the clay balls they absorb the chemicals. Bacteria that grow naturally convert the amonia into nitrates and nitrites. You then plant anything into the clay balls, just like any hydroponic system. The plants absorb the water as well as the chemicals. The end result is healthy plants and clean water. The clean water is then dumped right back into the fish tank to keep the fish happy and healthy! So this weekend I will be building a beautiful aquaponic system. I'll post lots of pictures and setup instructions. Well said, Geoff. I wouldn't change a thing. I look forward to seeing your installation and I'd like to invite you to come join our community of obsessed aquaponic gardeners at www.aquaponicscommunity.com. Hope to see you there! I hope you post pictures soon. This looks and sounds fantastic! What are you planning to grow?